Alcaeus (Alkaios) of Mitylene (ca. 620 B.C.E. - ? B.C.E. ), was an ancient Greek poet who was considered one of the greatest lyric poets of his generation. He was an older contemporary and an alleged lover of Sappho, with whom he may have exchanged poems. Like Sappho, almost all of Alcaeus' works have been entirely lost, and much of what we know of his qualities as a poet are derived through second-hand sources and quotations. Alcaeus' reputation was clearly immense in the ancient world, considering the large number of references to him which have survived. In particular, Alcaeus' reputation was still quite strong during the golden age of the Roman Empire, and he was cited by Horace as his principial role-model and inspiration. Of the fragments of poetry that survive, it is clear that most of Alcaeus' poetry was focused on one theme: warfare. An accomplished soldier in his own right, Alcaeus fought or participated in a number of major battles in Greece. According to legend Alcaeus was the only soldier of his company to survive during a particularly fierce battle between the Athenians and the Mytilenes— so remarkable was his survival that a number of surviving poems consist of Alcaeus refuting accusations that he had fled the battle. Alcaeus' surviving works are too scant to be thoughtfully analyzed, though some things are clear: Unlike Archilocus, Alcaeus seems to have approached the themes of war and heroism with sincere vigorousness rather than cynicism. Moreover, Alcaeus' mastery of ancient Greek meter is undisputed, and from a purely technical standpoint the fragments of his poetry which have survived are among the most perfect in existence today. Although Alcaeus is almost entirely lost to present-day readers, he was nonetheless one of the most influential figures of the ancient world, and, like Sappho, his influence lives on in the works of latter generations. Alcaeus was born into the aristocratic governing class of Mytilene, the main city of the island of Lesbos. The precise date of his birth and death are unknown. His poetry reveals that he had been involved in the politics of Mytilene during a time of relative unrest under the tyrannical king Melanchros. During a rebellion headed by Pittacus of Mytilene, a violent civil war broke out on Lesbos. Alcaeus sided with the rebels and his (probably much older) brothers, joining with Pittacus in a coup d'état which toppled the aristocratic Melanchros from power. Pittacus was considered one of the wisest rulers in all of Greece, and for some time Alcaeus was closely allied to him, even fighting alongside him in a battle against the Athenians at Sigeion near Troy where Pittacus defeated the Athenian commander, Phrynon, in single combat. Herodotus claims that Alcaeus ran away from the battle of Sigeion, and the allegations of cowardice are angrily answered in some of Alcaeus' verses. Alcaeus joined in an unsuccessful plot against the minor magnate Myrsilis, whose influence became strong following the removal of Melanchros from power. 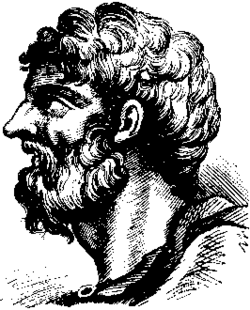 Pittacus, however, aligned himself with Myrsilis, after a bitter dispute with Pittacus over their differences, Alcaeus went into exile. After the death of Myrsilis, Alcaeus seems to have been reconciled to Pittacus and returned to Mytilene. This new alliance was not to last, however, and Alcaeus again found himself forced into exile, traveling as far as Ancient Egypt. One of his brothers joined the Babylonian army and fought under Nebuchadrezzar II. It is believed that Alcaeus eventually returned to Lesbos prior to his death, but his poetry includes bitter denunciations of his mistreatment at the hands of one-time friends as well as long-time enemies. Alcaeus' experiences in war and politics are reflected in his extant poetry, much of it militaristic in nature. There are references to mad efforts to survive upon a ship sinking in rough waters, the sight of helmetted, spear-toting soldiers marching in rows to the battlefield, and touching descriptions of the relief of welcoming a brother home from war. Alcaeus' more political poems also criticize the dangerous power of tyrants. In addition to this, a number of poems are devoted to refutations to accusations of cowardice at Sigeion. Despite their generally bootcamp flavor, Alcaeus' verses also contain lively references to the lighter side of life, including paeans to revelry, gambling, friendship, and the sea. Indeed, Alcaeus was counted as one of the most touching love poets of his era, as well as one of Greece's most popular authors of drinking songs. In general, it is clear that Alcaeus' poetry was primarily oral in nature, intended for recitation at symposia and informal gatherings; and it is perhaps a result of this clearly oral quality to his poetry that so much of it has not survived in writing. Of his surviving works, most consist only of tattered fragments. In the ancient world, however, it is clear that Alcaeus' works were well-preserved in writing for several centuries. In the second century C.E., in Alexandria, a compilation of Alcaeus' works was commissioned that filled over 10 books. Today, however, the poetry of Alcaeus has survived only in quotations: "Fighting men are the city's fortress" is one of the most memorable and oft-quoted lines. Judging Alcaeus' work is nearly impossible today, but it is clear from the immense fame he seems to have attracted during his own age that he was a poet of reckoning. From Horace, who was intimately familiar with the 10 Alexandrian volumes, we can at least catch a glimmer of Alcaeus' genius for versification, as found in Horace's famous alcaic verse-form. Alexandrian scholars agreed that Alcaeus was the second greatest monodic lyric poet among the Nine Lyric Poets of Ancient Greece. The considerable number of fragments extant, and the imitations of Alcaeus in Latin by Horace and other poets who regarded Alcaeus as their model, help us to form a fair idea of the character of his poems. Miller, A. M. A. M. Miller, "Alcaeus", Weslyan University. Elpenor, (tr. ); "Alcaeus: ZEUS RAINS", The Greek Word. This page was last modified on 25 February 2016, at 16:31.